Decorative items form an integral part of 21st Century interior design and cover a wide range of taste. Take for example furniture made by Maitland Smith, such as the tortoiseshell veneered and brass inlaid writing table sold in July 2014 (FS23/781). It is based on a traditional design but with a very contemporary feel to it. A Stylish Contemporary Tortoiseshell Veneered and Brass Inlaid Writing Table (FS23/781) made by Maitland Smith. Chinoiserie decorated furniture is always sought after at auction and recent successes have been a red lacquer and chinoiserie decorated breakfast table (FS23/770), Chinese coromandel lacquer screens (FS23/772) and occasional furniture decorated in red, black or green lacquer with chinoiserie designs, generally of pagodas and lake and mountain scenes. Equally a decorative item could be a Bavarian carved lindenwood hall stand in the form of a bear (FS24/855). Such furniture is extremely popular and the bear is widely used as a single object or otherwise incorporated into items of furniture. 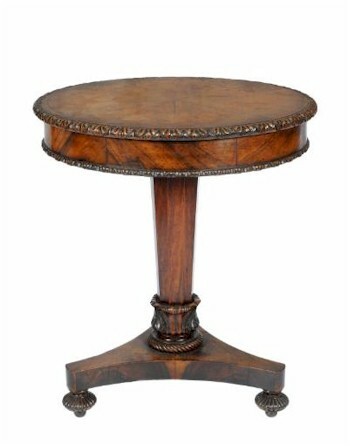 Of greater rarity is the camel and an example of this was recently sold by Bearnes Hampton & Littlewood, as a table on a camel support. An Irish Shell Cabinet (FS21/914) made by Elizabeth Penrose circa 1800 and decorated with glass animals from the Waterford Glass Factory. 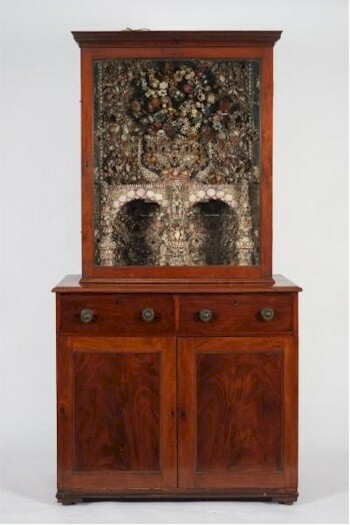 One of the most interesting decorative items sold by this auction house was an Irish shell cabinet made by Elizabeth Penrose in about 1800 (FS21/914). It was formed as a fantasy grotto and constructed from shells gathered around Tramore and along the tidal reaches of the River Suir in Ireland. Incorporated within the grotto are glass animals and swans from the Waterford glass factory. It was sold to an Irish museum. Vintage luggage from the Louis Vuitton manufacture is included within interior design and examples of Louis Vuitton trunks are regularly sold for four figure sums. A rare pair of Regency carved giltwood and Chinese reverse painted convex mirrors (FS20/1150) sold for £17,500 in October 2013. Mirrors form an important part of interior design and two of the best examples were recently sold by Bearnes Hampton & Littlewood, being a rare pair of Regency carved giltwood and Chinese reverse painted convex mirrors (FS20/1150). Each surmounted by a figure of an eagle, they sold for £17,500 in October 2013. Good examples of 18th Century mirrors are to be found by Thomas Chippendale and a particularly fine one is to be found in the Victoria and Albert Museum. This example of a girandole mirror is identical to a design in Chippendale's The Gentleman and Cabinet Makers Directory published in 1762. Other popular mirrors include Florentine carved giltwood mirrors with bold acanthus decorated frames, Irish mirrors with jewelled surrounds on ebonised grounds and Venetian marginal mirrors. 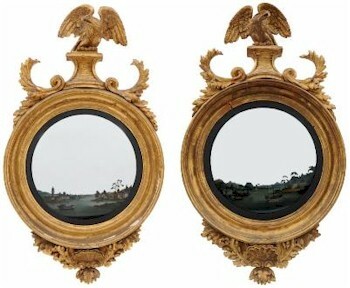 The use of the Ho-ho bird as a device was widely used on 18th Century mirrors. The Ho-ho bird takes its origin from Fenghuang, a mythological bird of East Asia commonly known as the Chinese phoenix. The Ho-ho bird has very high connotations being a symbol of virtue and grace.